AMC's zombie drama The Walking Dead is known for its tendency to kill off main characters on a whim. The show has had surprise death scenes since the very first season to show that nobody truly is safe on the series. It's par for the course with the show, but there's one particular new character fans really don't want to see go. This would be Daryl Dixon's new canine companion, simply called Dog, who's quickly become a fan favorite on the show. So many fans have taken to Daryl's new pet, in fact, that a recent petition was started online to keep Dog alive, and it's already earned over 44,000 signatures. The petition's creator cites being more sensitive towards TV and movie violence against animals than with violence against humans. Many animal lovers out there echo this sentiment, and it's apparent there are many fans fearful for the dog's safety. After all, the show is no stranger to killing animals. We've seen several horses perish in the apocalypse, not to mention a certain tiger in season 8. It looks like a bulk of the fans would prefer this to be the one animal they actually have survive. 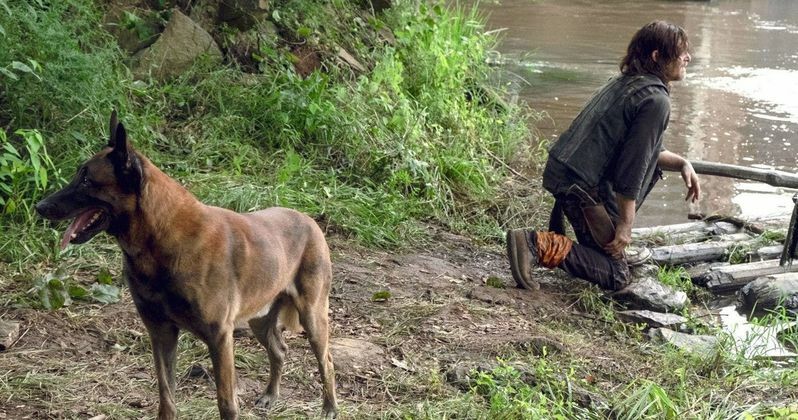 With fan favorites like Rick Grimes and Maggie now gone from the series, it seems Daryl's furry friend is filling the gap as one of the show's most beloved characters. This pressure from the fans to keep Dog alive is reminiscent to what people have been saying about Daryl since season 2. The phrase, "If Daryl dies, we riot," became such a popular saying it was eventually brandished on official Walking Dead merchandise. With actor Norman Reedus insisting he's around for the long run and the character remaining so popular, the fans have gotten their wish by seeing him survive for all these years and counting. With Rick Grimes out, Daryl, Morgan (who jumped to Fear the Walking Dead), and Carol are now the final remaining characters in this show's universe who've been around since the first season. It's unclear how long The Walking Dead will continue, despite AMC's insistence it has many years left to go. The ratings for season 9 are considerably lower than seasons past, putting the show's future in jeopardy. It's a shame as the new direction of the series from showrunner Angela Kang has been praised by fans and critics, but either way, millions of viewers are losing interest. Still, the network plans to produce at least three movies set in the Walking Dead universe with Andrew Lincoln reprising his role as Rick Grimes, finishing out the character's story. There are also tentative plans to create more spinoffs in addition to Fear the Walking Dead. As always, fans will just have to wait and see what ultimately happens with Dog. With falling ratings, it would seem Kang would want to give the fans what they want to keep them around. Their threats of rioting have kept Daryl alive for all these years, after all. Why not try the same tactic for his animal friend? To add your name to the petition, head on over to ThePetitionSite.